Cycloptic Media - The next generation of entertainment. 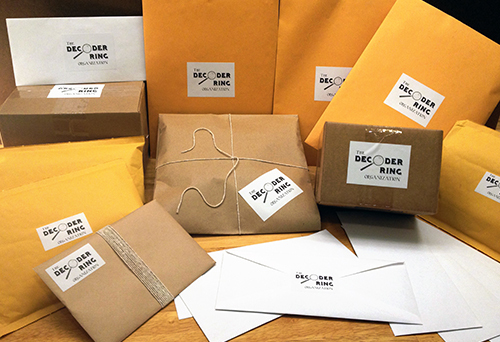 A fast-paced two month long mystery experience delivered to your door as enigmatic letters and packages. Everyone likes getting presents in the mail, and this experience is 8 weeks of packages and letters delivered right to your door. These gripping clues weave their way into a story that is perfect for examining by yourself or shared with others. A great gift for the curious, mystery novel readers, true crime addicts, ARG players, or just those looking for the next interesting thing. You'll be looking forward to checking your mail for a whole 56 days! The average novel, podcast, movie or television creates a barrier between the observer and puts them in a passive role. In this experience you are the main character- a truly integral part of the story. That may seem intimidating, but this experience is suitable for players of all skill levels. Players that excel at solving portions of the mystery will be rewarded with extra secondary clues or additional information, but the less experienced players will not miss any vital parts of the story by passing something by. The twisting and turning story will take the player to unexpected corners of the pain-stakingly crafted story world. There is a real variety to the physical things you will receive in the mail, and each object has a personalized and unique hand-crafted touch. The first season of this experience is set to start at the beginning of January following our Kickstarter, which is planned for October.